Shumaker Consulting Engineering & Land Surveying, P.C. (SCE) completed this term agreement providing asbestos assessment, abatement design, and project monitoring services to the New York State Department of Transportation. SCE was assigned eighty-three (83) individual projects over the three-year term. 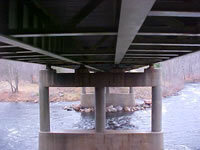 Responsibilities included: inspectors performing visual assessments of bridge and building structures, collecting representative bulk samples of identified suspect materials, and documenting all findings in assessment survey reports. SCE project designers recommended asbestos removal procedures, prepared site-specific variances, and developed asbestos abatement cost estimates. SCE also managed asbestos project monitoring services provided by our subconsultants through the Term Agreement. “Old Main” building were in poor structural condition, with roof and floor collapses in several areas. 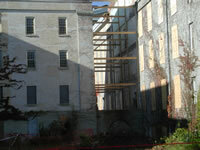 The demolition plan was designed to preserve the structural integrity of the core structure, including full demolition of the entire East Wing. Shumaker Consulting Engineering & Land Surveying, P.C. (SCE) personnel performed a detailed assessment of lead/asbestos-containing materials. SCE prepared plans and specifications for demolition, including variances for asbestos removal obtained from the New York State Department of Labor. SCE personnel prepared a detailed Air Monitoring Plan for lead materials subject to release during demolition activities. 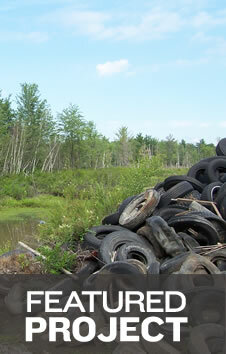 The demolition planning involved close coordination with the Oneida-Herkimer Solid Waste Authority, New York State Department of Environmental Conservation, and the City of Utica. Design issues included: working with unsafe historic structures; demolishing structures that could not be pre-abated for lead and asbestos; maintenance and protection of traffic; debris management and disposal for over 700,000 tons of building materials; and site restoration.